Our Classic, late 19th Century, "shingle style" Victorian Inn with carriage house was originally sited at the highest point of a former hillside pasture to advantage commanding views of the village of Rockport and the harbor beyond. The distinctive setting included a small orchard and a "stone apple shed" to house the apple harvest through the winter months. 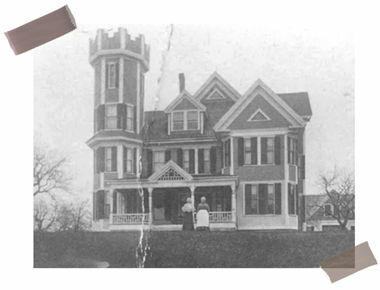 As our research shows, the Inn began as a private residence built by Robert Herne, a superintendent for the Atlantic Cable Company, for his new bride in 1893. Originally constructed as a three-story home with a fourth story tower, it appears that the fourth floor of the tower was removed for reasons unknown, resulting in the Inn's current configuration. Fortunately, we have a photo of the original structure on display in our front living room. Following World War I, Sumner and Helen Wheeler assumed ownership. Sumner Wheeler practiced law from his home, subsequently becoming Rockport's Town Attorney before being named the Law Librarian of the Superior Court in Salem, Massachusetts. Unexpectedly, we found 16mm film of the property taken around 1940, which presents the Wheeler residence in all its gradeur. We were told by a retired gardener who worked the Wheeler property that the Wheeler name was spelled out in white Alyssum on the front banking. For the next 65 years, the property remained in the Wheeler Family. Following Sumner's death in 1957, Helen ran the household until she first sold the orchard in 1979, followed by the residence in 1981. An energetic couple, Jim and Mary Hayes became the 3rd owners, and only after three years these aspiring young teachers made career advancements taking them to the Boston suburbs . . enter your intrepid innkeepers. In the fall of 1984 we purchased the property and immediately began a conversion from a residence to a guesthouse . . the Pleasant Street Inn was in the making. That winter we re-wired, installed new bathrooms, cleaned and painted. 1985 saw the Inn's door swing open offering guests four rooms. Winter renovations continued in 1986 yielding three additional rooms. The Inn's 8th guestroom was converted in 1991. We now turned our attention to our neglected carriage house. By the summer of 1993, a two-story addition was added to the rear of the structure producing a spacious apartment with all the amenities of home, featuring two bedrooms and two baths, rented weekly during the summer season. 1996 saw the addition of a new well and irrigation system ensuring the health and longevity of the Inn's majestic trees, mature plantings and welcoming flowerbeds. Each year we engage in decorative and/or comfort enhancements to our Inn. We have always felt it's wise to invest in the enjoyment and comfort of our guests and yes, the Norris Family. We strive to provide a comfortable environment for our guests that return from year to year.